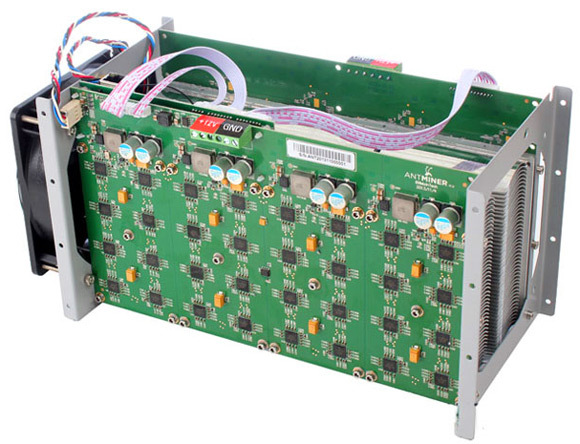 The company Bitmain Technologies has announced that the production of the successor of their 180 GHs AntMiner S1 Bitcoin ASIC (on the photo above) is underway and they are going to be shipping the 1 Terahash AntMiner S2 starting in April (next month). The Bitmain has become known for their fast shipping and very competitive prices that go down with the difficulty increase and they are yet again showing how to do business with BTC ASICs. The new S2 units are based on the company’s 55nm BM1380 chips that are used in the S1 miners, but apparently they have managed to achieve high-density chip chains and lower power usage in order to be able to squeeze 1 Terahash in a 4U case along with a 1000W PSU manufactured by Enermax. The pre-orders for the first batch of the new Bitmain AntMiner S2 1 THS ASIC miners have been filled with a price of $3899 USD (6.34 BTC) and a shipping date of April 1st (not a joke hopefully), the second bach of devices is scheduled for April 10th shipping and the price is a bit low at $3599 USD (5.852 BTC) and there are still units available. The new S2 miners do come a bit more expensive than 5x AntMiner S1 miners overclocked to 200 GHs each to give you a total of 1000 GHS with a price of less than 5 BTC. The difference however is that the power consumption for the S2 miner is 1000W and for the same hashrate with S1 miners you would get roughly about 2100-2100W. So with S1 you get cheaper price for the hardware (you will need to also buy 5x 500W+ PSUs for the miners), but more than double the power consumption for the same hashrate, even though the same chips are used in both products. Putting more BM1380 chips running at lower voltage and frequency is what BitMain has done in order to lower the power usage and get better performance per watt without having to increase the cost of the hardware too much.